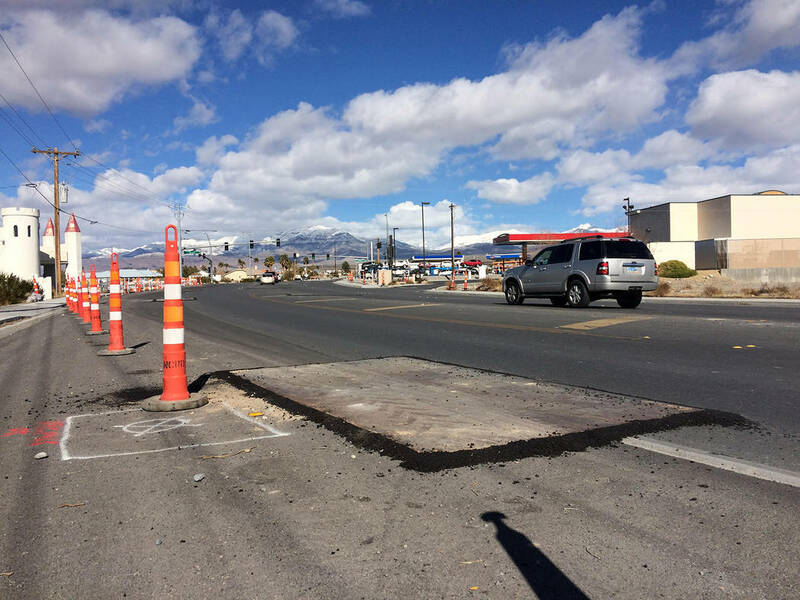 Throughout the previous few days, Pahrump area drivers may have noticed the addition of large steel plates in the roadway at the intersection of Highway 160 and Homestead Road. 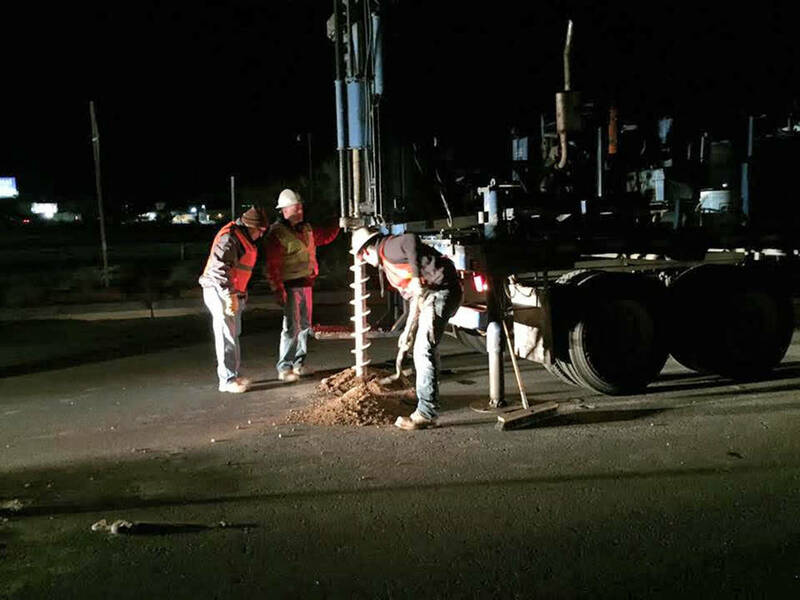 Special to the Pahrump Valley Times Work crews are pictured performing core drilling at the intersection of Highway 160 and Homestead Road in Pahrump. Photo courtesy of Nye County Public Works. Robin Hebrock/Pahrump Valley Times Large metal plates were installed on Homestead Road following the start of soils testing by Great Basin Water Company early this week. The plates are no longer in place, as the testing has been completed. The results will be used to form the engineering plan for construction to repair the road, which was damaged by a water main break. Those plates have since been removed, leaving behind evidence of holes drilled into the road base. This is where Great Basin Water Company is conducting soils testing, a necessary step toward creating the engineering plan required by Nye County, so construction can commence and the intersection be returned to normal. The area has been languishing as a cone zone for more than a year, after a water main break occurred within the Great Basin Water Company utility system in late 2017. At that time, one of the two southbound lanes of Homestead Road at Highway 160 had been closed off from traffic. This remained so for six months, before safety concerns prompted Nye County to lay a temporary layer of cold mix and reopen that lane in May 2018. Despite the lane reopening, the intersection has continued to be lined with construction barriers and the sidewalk has been closed for nearly 15 months, a source of frustration for many, both public and county officials. The soils testing is a sign that this issue may finally be moving toward a resolution. “Great Basin Water Company will be testing the soil in locations on Homestead Road at, in and around the area of the waterline break, with one of the bore holes being done on Winery Road to be used as a control point,” Nye County Public Works Director Tim Dahl told the Pahrump Valley Times on Monday, Feb. 4, shortly after the steel plates appeared on Homestead Road. The testing extended into Wednesday night and Thursday morning as well, with a notification posted to the town of Pahrump’s Facebook page. The posting detailed that the utility’s contractor was drilling 14 total holes to a depth of 10 feet, which was completed by 6 a.m. Thursday, Feb. 7. The testing results will be used by Great Basin Water Company’s soils engineer to determine a plan for construction, Dahl explained at the Feb. 5 Nye County Commission meeting. “Once they get those core drills, we’ll have some idea on what it’s going to take to repair that area and move that repair forward, as we all wish that would have been done a long, long time ago,” Dahl said.